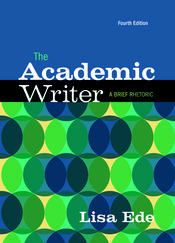 The Academic Writer is a brief guide that prepares students for any college writing situation through a solid foundation in rhetorical concepts. By framing the reading and composing processes in terms of the rhetorical situation, Lisa Ede gives students the tools they need to make effective choices. With an emphasis on analysis and synthesis, and making and supporting claims, students learn to master the moves of academic writing across mediums. A new chapter on "Strategies for Multimodal Composing" and advice on writing in a multimodal environment throughout the text help instructors take students into new contexts for reading and composing. New coverage of drafting, editing, and revising, and updated coverage of academic research--including the 2016 MLA guidelines--ensures that students are supported at all stages of the writing process.